» Portable Air Conditioners vs. Evaporative Coolers – What’s the Difference? Portable air conditioners and evaporative coolers are both popular options for those that want to provide isolated cooling or additional cooling to a home, whether the home has central air conditioning or not. While both of these units are certainly capable of cooling, they have many distinct characteristics that differentiate themselves from each other, especially in regards to where they can even be used in the first place. Let’s dig in a bit further to get a better idea on just how different these two units are. Evaporative coolers, also known as “swamp coolers,” are air cooling devices that rely on some basic science to emit cool air into a room. These units rely on fans and water to create a cool air blast that can decrease the temperature in a room by 20 degrees Fahrenheit, while decreasing the ambient air anywhere from 5-9 degrees Fahrenheit on top of that. The evaporative cooling effect actually occurs naturally around us, sometimes on a daily basis. An example of this is the chill you feel right when you step out of a pool on a hot day. This cooling effect occurs because of the dry air that passes over water on your skin, absorbing some of the water as it passes. This absorption of the water occurs when both the temperature and vapor pressure of the water attempt to equalize with the air. The resulting effect is the molecules turning into gas molecules, making the heat switch from a higher air temperature to the lower temperature of the water. The area is cooled because the air circulates on its own. 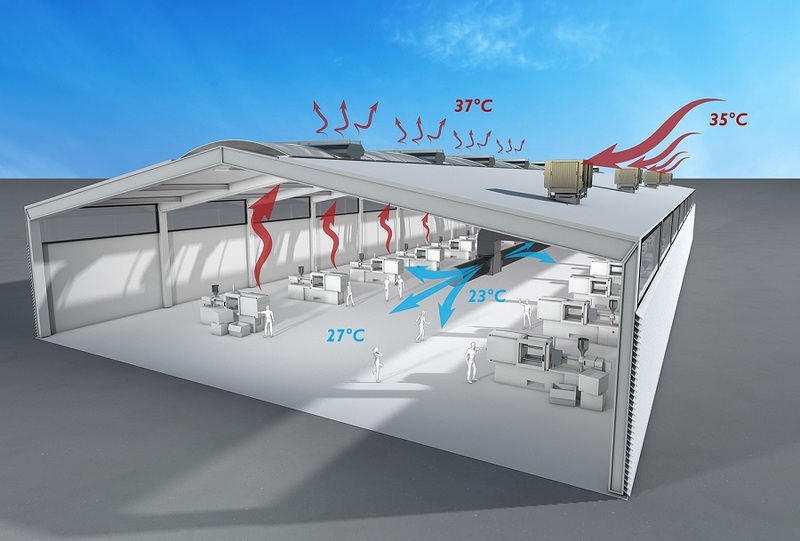 Evaporative coolers operate off of this concept. 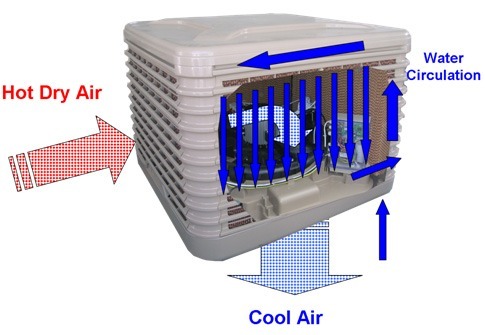 The cooler uses a fan to draw warm, stale air inside the unit, and passes over pads that are moistened by water, blowing the cool air out of the unit. Operation: Evaporative coolers are very simple to operate, and can be easily moved from one room to the other without having to worry about hooking up ventilation hoses and drains. Energy Usage: Evaporative coolers don’t use a condenser, or any complicated parts that eat up wattage. They are essentially big fans that blow air over moisture. 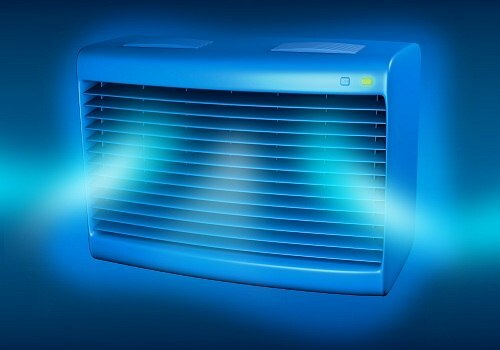 This can sometimes be up to 75% cheaper to operate than a central air unit. ​Maintenance: These units don’t require much in the way of maintenance. They need to be cleaned every few weeks after heavy use, and may sometimes need the moisture pads switched out, but that’s about it. Adds Moisture When Needed: Evaporative coolers put plenty of moisture back into the air. If you live in a very dry climate, or have a dry part of your home that poses risk to wood items and anything else prone to warping in dry heat, these coolers serve a double purpose. Climate Restricted: This is a big drawback. Evaporative coolers can’t be used just anywhere. They rely on having dry air present in order to provide any cooling. If you live in a humid climate, or have a humid space you are trying to cool, these coolers are of no use to you. Lack of Added Features: Evaporative coolers are very basic appliances, so they lack many added features that you can find on portable and window air conditioning units, such as a heat pump, dehumidifying capabilities, and many programmable features. The use of evaporative coolers is largely restricted to desert-like areas, and regions in the south and western parts of the United States. Despite their nickname of “swamp coolers,” implying a certain use, evaporative coolers are useless in swampy, humid areas. Portable air conditioners are a smaller version of a central air unit -- only all of the parts are contained in one space, rather than most of the unit being outside. Portable A/C’s contain the same refrigeration chemicals as their bigger cousins, and also make use of a compressor, a condenser, and evaporator to create the cooling process. The process for a portable air conditioners is a bit more complicated than an evaporative cooler. The refrigeration chemicals of the unit arrive to the compressor as a cool, low-pressure gas, while the fluid is squeezed while passing through the compressor. The molecules within the chemicals are then pushed closer together -- the tighter they are pushed, the higher its temperature and energy. The chemicals then leave the compressor and enters the condenser as warm gas with a high pressure. The gas is then cooled while passing through the compressor, becomes liquid, and passes through a small opening and into the evaporator. Pressure drops, and the liquid becomes gas once again. The cool air that results from all of this is released into the immediate area, while the gas returns to the compressor and begins the cycle again. No Climate Restriction: Portable air conditioners can work in any climate, and most any space. ​Dehumidification: These units eliminate moisture from the air as part of the cooling process, resulting in a more comfortable room, while also being better to those susceptible to allergies. ​Other Features: Portable air conditioners often come with numerous added features that allow them to do more than just cool. All units can both cool and provide air circulation, but many more can also provide heat, or function solely as humidifiers when needed. Energy Usage: Portable A/C’s require a much higher amount of wattage than an evaporative cooler, which likely means a higher energy bill when the two are compared. Limited Areas of Use: These units need to be ventilated, so they must be near a window, sliding door, or a special hole made in the wall to help direct the flow of hot air away from the space. This limits where you can use them. Evaporative coolers are effective at providing a noticeable amount of cooling while using very little energy. These units will work well for you if you live in a dry climate, but portable air conditioners are more versatile and require less maintenance.